First of all, I really want to thank everyone that entered the giveaway last week. I loved reading about all of the Christmas memories. So many really sweet stories were told; I encourage you to take a peek at the comments and read them. It was very heartwarming. Julia drew two winners. My gifts were sent off to Kelly (she won the bunting) and Sarah (she won the tablerunner). Interestingly, both winners hailed from Pennsylvania! Congrats to both! I have been busy in my sewing room over the past week. Working on my row quilt, Christmas gifts (which I will share after the holidays), a very frustratingly fluffy yellow bathrobe and a gift for my dad for his upcoming birthday. Where to start? Let’s go with the frustrating stories and end up on a more pleasant note, shall we? Oh, this bathrobe! The fur and fluff that flies when I work on it is truly amazing. I had NO idea what I was getting into and never will I buy such a fluffy fabric again! I have the robe basically assembled – I sneezed my way through it only to find that it will fit nicely once I gain about 75 pounds. I don’t know how to account for this. I made it a size small (8-10) but honestly, I could wrap it around me twice over. When I re-read the post about planning to make this, I can hear a very cocky tone in retrospect. I said that garment sewing came naturally to me because I had done it so often. In some ways that is true. 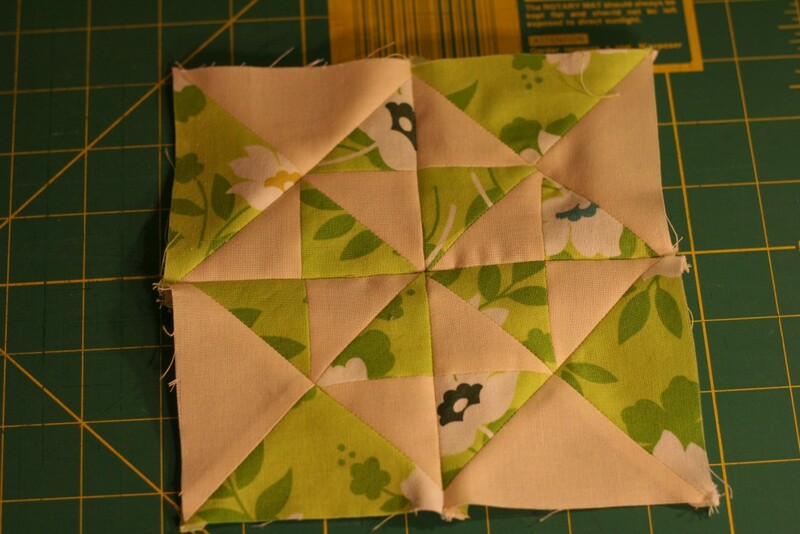 I knew how to put it together, didn’t need to ponder the directions, just dove in and sewed. But what about trying the thing on? At least holding it up to me in front of a mirror at some point?? Nope, as I was getting ready to hem it, I thought, ‘hmmm, this looks a tad large’. I put it on and my jaw dropped. It frustrated me because I can only imagine the fluff that will fly if I try to take a seam ripper to it. I tossed it on the bed in the sewing room where it landed in a cloud of yellow. There it sits, waiting until I calm down and decide how to fix it. With that one done, I quickly made another. So far, so good. Right now I have all the rows hanging over the back of the couch (luckily we have two!) I am at the stage where I am moving rows around, trying to decide what order to put them together with. I need to get sashing fabric too. I don’t have any stash that is long enough and I don’t want to piece the sashing. I do love how this is coming together and hopefully I will get it assembled in the next few days. I also wanted to show you how pretty the Swoon Mini looks. I hung it on the wall behind the Christmas tree and the lights just make it glow. I just love it. I need to make another one that doesn’t have a holiday theme. I hope your recent sewing efforts are a bit more successful than mine have been. I feel I am turning the corner though. Ready for success. Linking to Freemotion by the River and Let’s Bee Social. Links to these two lovely blogs are at the top of the page, under Link Ups. This entry was posted in Garment Sewing, Giveaway, Row Quilt, RSC Challenge and tagged Classic Stitches BOM, giveaway on December 16, 2015 by Bernie. Love the quilt behind your tree! We are all getting over worked and weary so close to Christmas, so , we need a chuckle, Will you post a picture of the you in the robe/snuggle?? Hi Vickie! I ran into Julie at SPD the other day and she said she is working for you now? That is great. Her son and Kyle have been buddies since at least the 4th grade. Such a nice family. Hmmm…. Maybe I will post a picture once I figure out how to size that yellow monster down by about half! 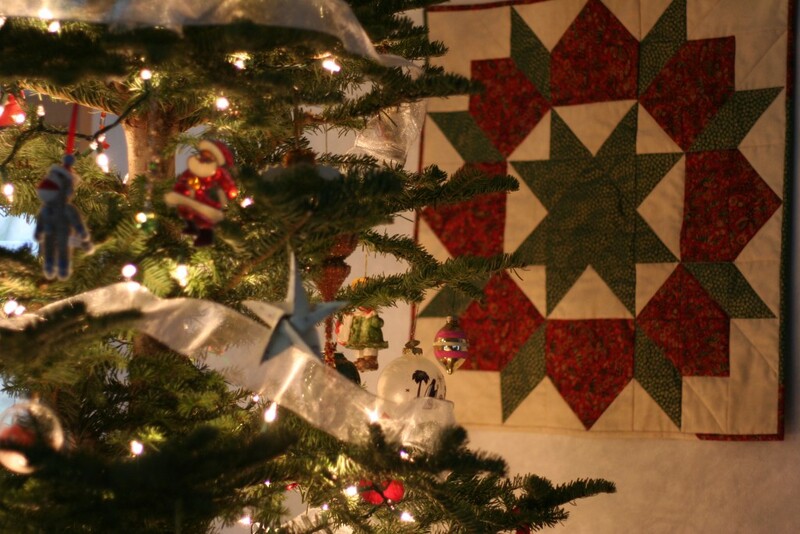 The swoon quilt looks fantastic behind your tree! I’m sorry to hear about some of the sewing frustration you faced this week, but it sounds like you came up with a great solution for the BOM and sometimes we all need to let projects sit in a time out while we ponder how to proceed. Time out. I like that. Yes, that robe will just sit there until I figure out what to do with it. My thought at the moment is to rip the hems out on the sleeves and literally cut the side seams off by a couple of inches and re-sew. But this is a drastic move so I need to ponder it a while longer. Have a great week Yvonne! That same thing happens to me too Bernie, where I make a few blocks just fine and then hit a wall on another. This is going to be a gorgeous row quilt when finished! Beautiful wreath and swoon quilt! And good luck with the monster bathrobe battle, LOL. Thaks for stopping by and commiserating with me. Bernie you always make me laugh. I feel that same sense of pride many times before I “fall”. I love your gentle, self-deprecating humor. 😉 I actually love that green row – the change in height with that color is perfect. Your quilt is going to be gorgeous. Wow your wreath is so beautiful – I can almost smell it! 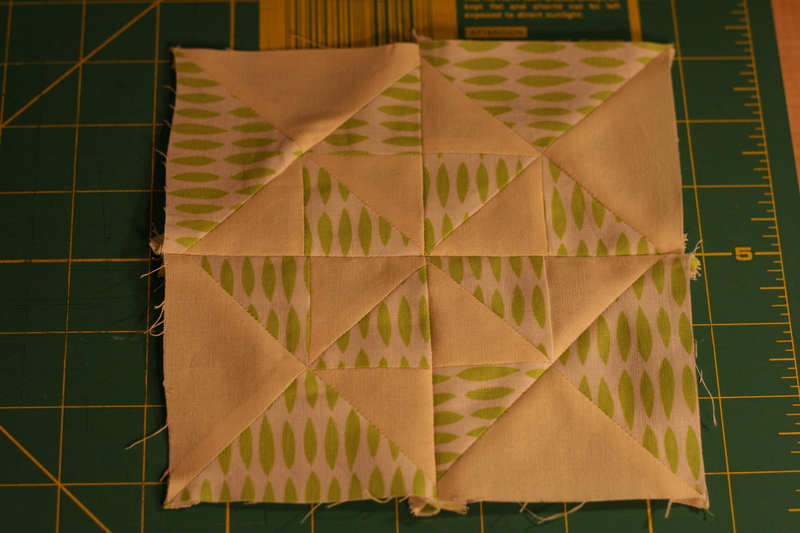 Ah there’s that Swoon block again – how I love it! Hi there! How are things? Hoping all is going well for you. I kind of think that if we can’t laugh at all of our silly issues, we will drive ourselves crazy. That yellow fluff flying all over the sewing room was beyond absurd. I was covered in it. Ah well…. if that is the worst thing I have to deal with than I should count myself as very fortunate. The Swoon Mini is so perfect there behind the Christmas tree and the lights just make it so lovely. I also think you’re wreath is marvelous. Such a busy gal!!! Don’t worry about the third block. Sometimes we put such pressure on ourselves and we should just feel free to quit and give ourselves a break. Merry Christmas Marsha! Thanks for your sweet comment. Isn’t it funny how a person’s brain just quits? I couldn’t sew that block together correctly for anything. Who knows why? My brain just gave up on it I suppose. You are certainly correct on the self-imposed pressures. The fluffy monster bathrobe that ate Bernie! That’s hilarious. I often had trouble with sizing in clothing patterns. They really have no correlation to actua humans. At least it wasn’t a fitted blouse! And I agree, just cut those seams and restitch. Think about how snuggly it will be when done! Have a great day, Bernie, and happier sewing to you! Your rows look so neat on the couch (thank goodness for design wall couches and other places to sit), and the little green row just makes the others sparkle. And speaking of sparkle, I love how your tree looks with the swoon mini. You’ve got me staring at the wall behind my tree. We have to take a painting down during the holidays when we put the tree up, but a quilt would look just right behind it. Hmm. Another year, perhaps. 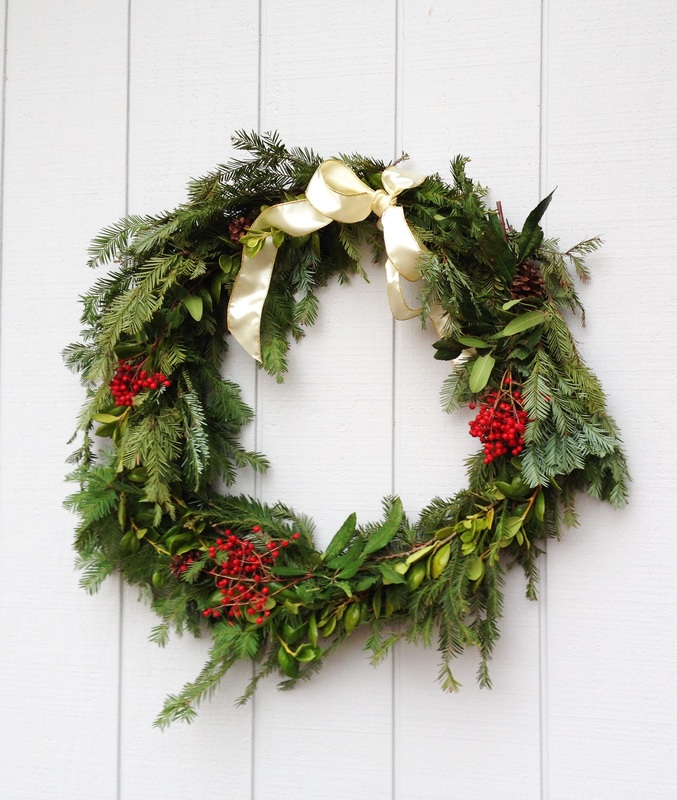 Your wreath looks lovely–and it’s so neat that you were able to make it with boughs from your own yard. I am positive that you have a choice of lovely Christmas quilts that you could hang near your tree. The only problem is choosing which one! We also take a picture down from the Christmas tree spot so it was nice having the hanger right their on the wall to use for the swoon.